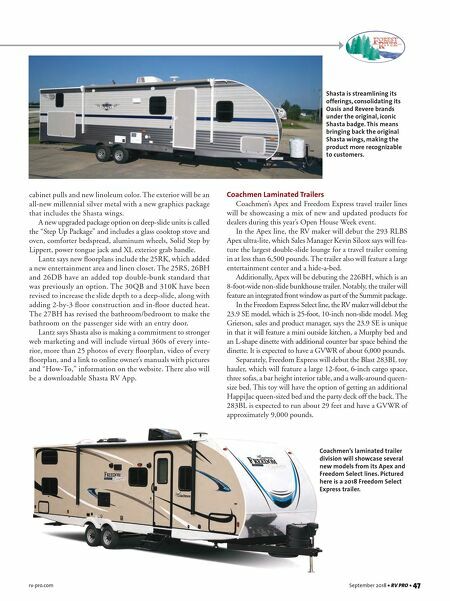 46 • RV PRO • September 2018 rv-pro.com R V M A N U F A C T U R E R S floorplan with front opposing slides. The motorhome will have theater seating, sofa, 50-inch TV, dinette, washer/dryer and a king bed. "It is very spacious and open and will be great for a number of different campers," Eppers says. "It will also include the popular Mirada features, such as solid-surface countertops, fiber- glass roof, tile backsplash, flush floor, and pass-through storage and will maintain a mid-level gas price point. We believe this will help our growing Mirada market share continue to grow." 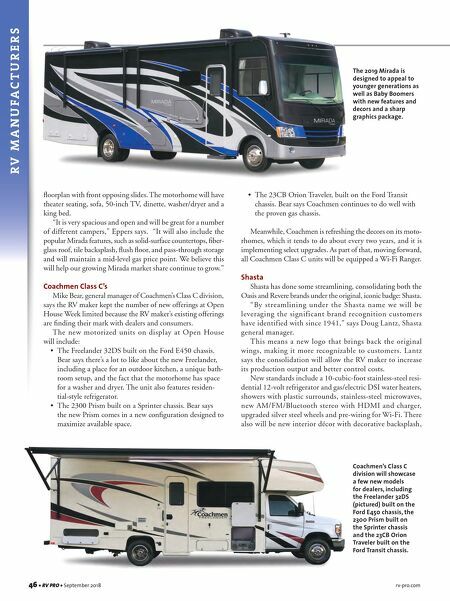 Coachmen Class C's Mike Bear, general manager of Coachmen's Class C division, says the RV maker kept the number of new offerings at Open House Week limited because the RV maker's existing offerings are finding their mark with dealers and consumers. The new motorized units on display at Open House will include: • The Freelander 32DS built on the Ford E450 chassis. Bear says there's a lot to like about the new Freelander, including a place for an outdoor kitchen, a unique bath- room setup, and the fact that the motorhome has space for a washer and dryer. The unit also features residen- tial-style refrigerator. • The 2300 Prism built on a Sprinter chassis. Bear says the new Prism comes in a new configuration designed to maximize available space. • The 23CB Orion Traveler, built on the Ford Transit chassis. Bear says Coachmen continues to do well with the proven gas chassis. Meanwhile, Coachmen is refreshing the decors on its moto- rhomes, which it tends to do about every two years, and it is implementing select upgrades. As part of that, moving forward, all Coachmen Class C units will be equipped a Wi-Fi Ranger. Shasta Shasta has done some streamlining, consolidating both the Oasis and Revere brands under the original, iconic badge: Shasta. "By streamlining under the Shasta name we will be leveraging the significant brand recognition customers have identified with since 1941," says Doug Lantz, Shasta general manager. This means a new logo that brings back the original wings, making it more recognizable to customers. Lantz says the consolidation will allow the RV maker to increase its production output and better control costs. New standards include a 10-cubic-foot stainless-steel resi- dential 12-volt refrigerator and gas/electric DSI water heaters, showers with plastic surrounds, stainless-steel microwaves, new AM/FM/Bluetooth stereo with HDMI and charger, upgraded silver steel wheels and pre-wiring for Wi-Fi. There also will be new interior décor with decorative backsplash, The 2019 Mirada is designed to appeal to younger generations as well as Baby Boomers with new features and decors and a sharp graphics package. Coachmen's Class C division will showcase a few new models for dealers, including the Freelander 32DS (pictured) built on the Ford E450 chassis, the 2300 Prism built on the Sprinter chassis and the 23CB Orion Traveler built on the Ford Transit chassis.